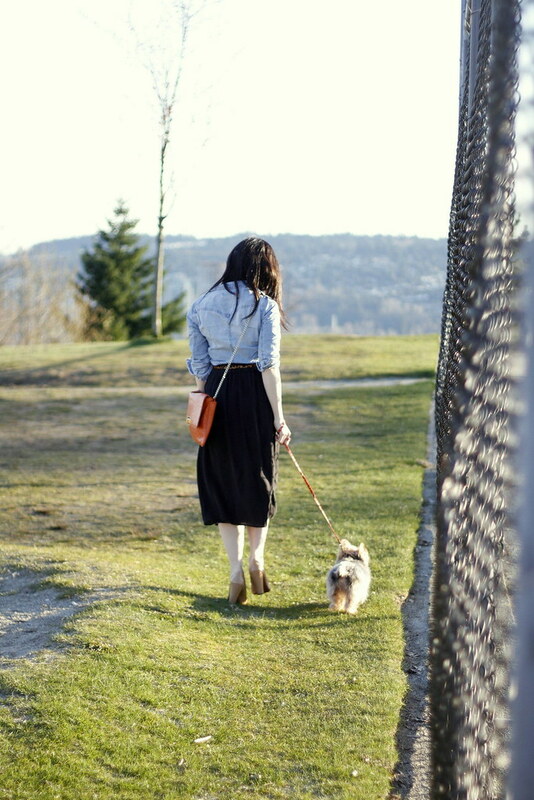 I love these photos that D captured of his puppy and I last weekend on a late afternoon sunny day walk. This hyperactive, sweet mini bundle of fur means so much to me: prior to meeting him, I never really cared for any animals at all. Now that we’ve had a few years to bond, I can’t help but gush at every single dog I come across on the street! So here’s to our canine best friends: the unconditionally affectionate, loving and delightful little (and sometimes big) creatures with hilarious personalities all their own. p.s. it took a while, but I am entirely grateful and feeling so blessed to have reached 1000 GFC followers. Thank you so much! Stay tuned for a giveaway next week! this is so cute! love your bag! aww, so sweet! I love this pics. Jen! These pics are the sweetest! Congrats on reaching such an enormous number of followers! Love your bag and cute pics of the puppy. congrats on reaching so many followers. Love your blog. 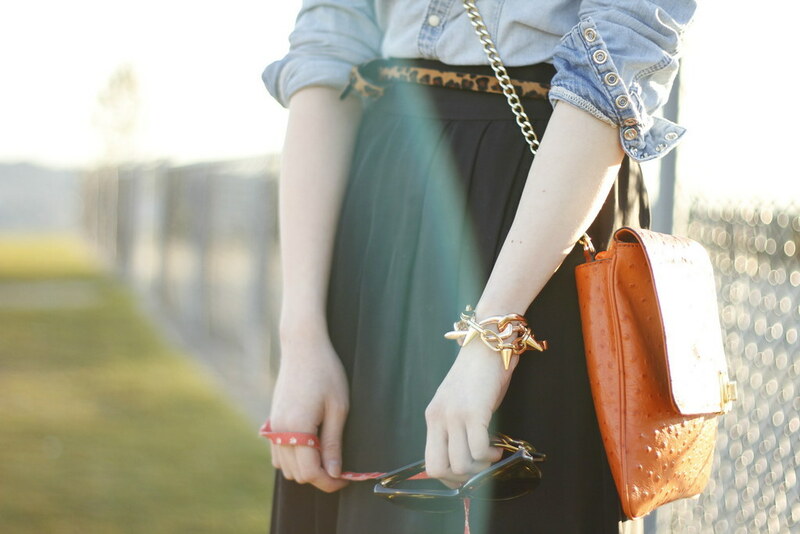 Super cute outfit, love the midi skirt with chambray! Seems fun and unexpected! i wannnt a puppy now!! ur dog is soo cute! Cute puppy! That’s the exact one that I want! Congrats on a 1000 followers! I love this outfit…great way to style a chambray, which I am so obsessed with right now 🙂 And D took some great photos here…the pup is so cute! Aw! I love all dogs that aren’t my own 🙂 I can’t have one, though – too many allergies. But if I did, I’d want hi to look like a teddy bear, just like this little guy. So adorable! You’re looking lovely as always, Jen. And congratulations on your latest blogging milestone, your hard work is definitely paying off! LOVE these photos! You both look so adorable, and the lighting is perfection 🙂 The little guy definitely adores you. SO cute! I love small dogs!! Cute outfit too. Congrats on your 1000 followers! PS. If you’re interested, check out my $50 Gift card GIVEAWAY! There are so many cute puppies here in Vancouver! I always considered myself as a cat person, but seeing all those cuties walking around here… I can’t help but dreaming about a pups of my own! your pictures light up my day for sure! you are lovely!!!!!!!! The first photo of you and the puppy is too cute for words! It definitely needs to be framed 🙂 Congrats on reaching 1000 GFC followers! I’ve really enjoyed watching your blog grow and can’t wait to see where you’ll take it. i was more of a cat person until i met my now ex bf – now i am totally into dogs! i would love a beagle, but generally i fall for any small to medium sized puppies 🙂 the big dogs scare me a little, haha! Uh, I’m turning green everytime I see that clutch (worn on the shoulder today)… You look as lovely as ever!